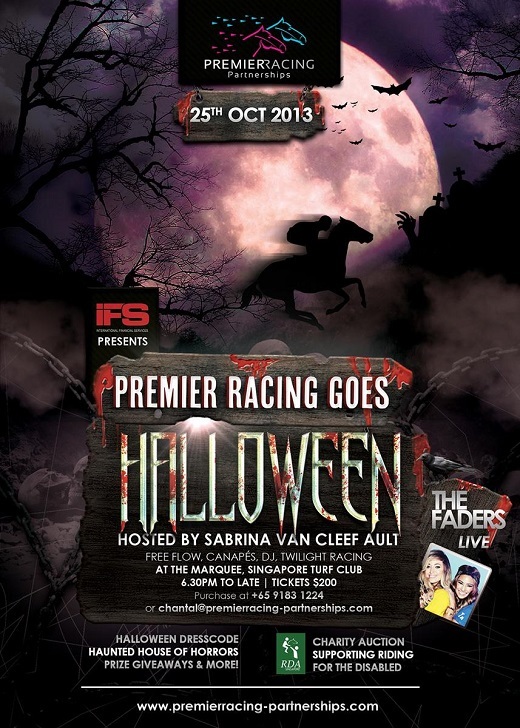 International Financial Services (IFS) and Premier Racing Partnerships invite you to one of Singapore’s biggest Halloween parties for a good cause when Premier Racing Goes Halloween on Friday, 25 October 2013! In aid of Riding for the Disabled and hosted by the glamorous Sabrina Van Cleef Ault, you’ll be welcomed into an elaborate haunted house at Singapore Turf Club’s The Marquee. Look the part with help from our very own make-up specialists available to help you complete your costume, then enjoy free-flow drinks and canapes before our special guest DJs THE FADERS hit the decks to party up a storm with their infectious, feel-good style! And it’s all for a good cause with special events to raise money for our adopted charity, Riding for the Disabled Singapore. So book your tickets now and join us up at The Marquee, Singapore Turf Club, for the year’s hottest and biggest Halloween party, and help raise money for a great cause! For further information and to buy event tickets, visit Premier Racing Partnerships facebook page.